Around here, we look forward to spring—not because of what’s blooming, or how epic the surf’s been, but because it’s when we at Maui No Ka ‘Oi get to champion a handful of Maui folks who work tirelessly to preserve and protect the natural beauty of the island—without pomp, fame, or stock options, we might add. Each of these environmental heroes has found a niche in which to channel his or her passion, from preserving coastlines or native forests, to dealing with stuff most of us choose to overlook, like what gets tossed on our roadways, or dumped into our waters. But here we honor them for something more. True heroes, by definition, inspire and lead by example. And in doing so, they elevate us all. To compile our list, we poke around, solicit comments from readers and all of the people we know, and get the coconut wireless a-jingle. Resoundingly, certain names come back to us over and over. Like epicenters of their own little earthquakes, these folks radiate knowledge and energy into the community, directly inspiring those around them and benefiting the rest of us in ways we sometimes aren’t even be aware of. Lucky we live among people like these. School’s out for Ed Lindsey. Out of doors. After thirty-three years of teaching in Maui’s public schools, the affable Lahaina native retired from the school system, but he didn’t leave his classrooms. He just moved a couple of them outside. Lindsey’s bigger classroom is five miles long, half a mile wide, and runs from the mountain to the ocean. Instead of desks, chairs and bulletin boards, it has petroglyphs, temple ruins and taro ponds. It’s Honokowai Valley, a place Lindsey likens to “a natural book, with all the pages still intact.” Since 2000, Ed, his wife Pua, and hundreds of volunteers from all over the world have been clearing the valley of invasive plants, boulder by boulder. A smaller and more recent teaching venue is high on a West Maui ridge at Hana’ula, the site of Maui’s first wind farm. There the Lindseys and their volunteers spend Sundays replanting indigenous trees in a tract of native forest displaced by three towering wind turbines. In both situations, the Lindseys’ nonprofit Maui Cultural Lands, Inc., has negotiated what Ed terms “win-win” relationships with the landowners. Honokowai owner Ka’anapali Development Corporation, and wind-farm lessor the State of Hawai’i, gain green karma through Maui Cultural Lands’ work. The organization, in turn, gains regular access to remote sites deemed vital for the restoration of Hawaiian flora and culture. “I’m not an environmentalist in the Western sense, but a culturalist,” Lindsey explains. 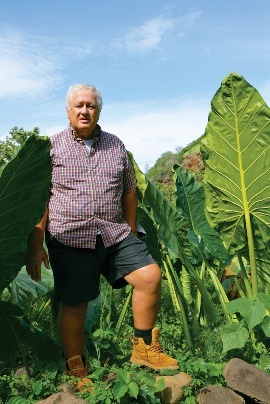 Maui Cultural Lands welcomes volunteers at both sites, but doesn’t need mere sightseers. “The only way to visit us is to work,” grins Ed. His husky physique and strong hands attest to his own labors in family lo’i (taro paddies) and aboard the twin-hulled Polynesian sailing canoes on which he logged 3,000 nautical miles earlier in life. At Honokowai and Hana’ula, “there’s enough work for five lifetimes,” he says, only half-joking. The work includes chain-sawing and chipping invasive trees like guava, haole koa and Java plum to clear space for native Hawaiian plantings. Invasive vines and ground covers must be peeled back and replaced with pili grass, native sedge, and indigenous ground covers like “Hikiaka’s blanket” (Pa’u o Hikiaka). Luckily, hundreds of volunteers have answered the call of the conch shell to help at both sites. They include students from a half-dozen Maui schools, visiting Sierra Club members and mainland collegians, Americorps cadets and inmates from the Maui correctional center. The helpers range from preschoolers to octogenarians.